Remember I said to look out for the contest where you can win a trip to Boracay? Here it is! 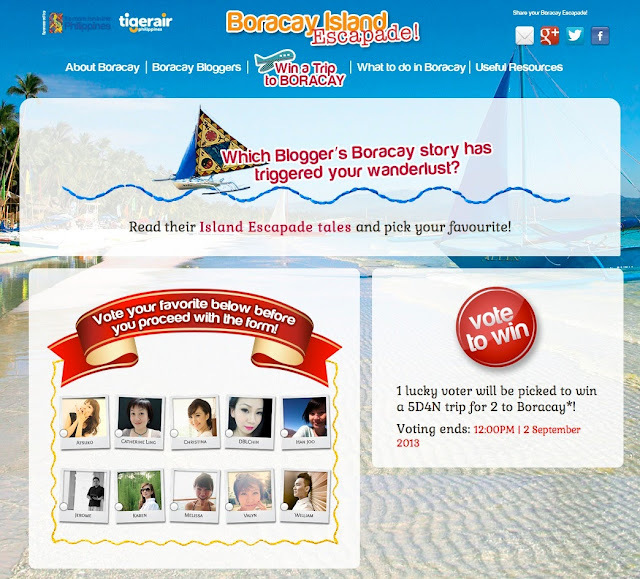 Vote for your favourite blogger and stand a chance to win a trip for 2 to Boracay Island, Philippines! You can vote once every day. The winner will be chosen regardless of who they vote for. Return airfare on Tigerair Philippines from Singapore to Kalibo and fuel taxes. I actually have more posts coming on Boracay. I will try to put them up before the contest ends Sept 2.